An amazing flyfish destination just a 20-minute drive from Cancún, Isla Blanca. 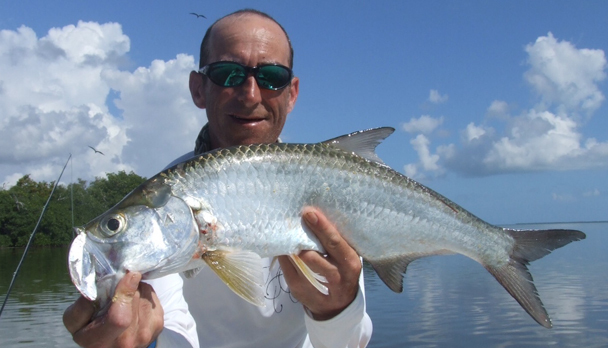 It has a fishing area of over 60 square miles with vast flats, beautiful beaches and paradise islands are home to permit, tarpon, snook and bonefish. Located just 20 minutes far from Cancún, Isla Blanca has access by the sea to a rich fishing area of over 60 square miles. 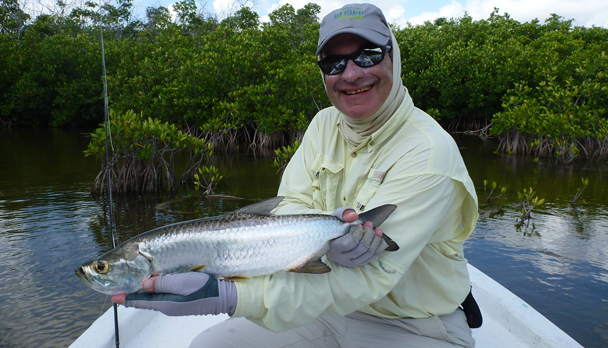 Vast flats, beautiful beaches and paradise islands are home to permit, tarpon, snook and bonefish. This is a quiet area, without any fishing pressure and virgin natural surroundings. Anglers have an excellent chance of getting a Grand Slam (Permit, Bonefish and Tarpon or Snook) in a single day or in a few days of fishing. 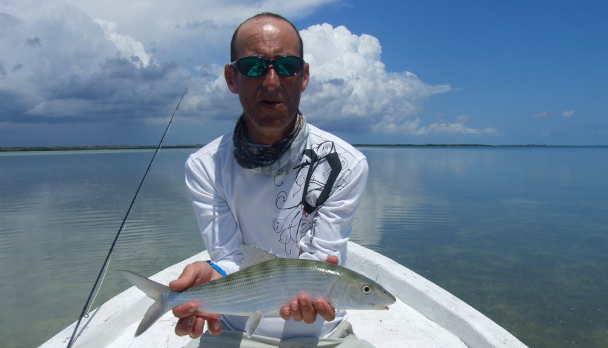 The fishing area covers the South from the flats of Chacmuchuc lagoon reaching the North up to Cayo Ratón, Punta Iglesias and Cabo Catoche (Holbox Island). To the East, up to Contoy Island. Isla Blanca has proved to be the perfect destination for those who want to spend a day or two of fishing while they are on a family vacation in Cancun or for those wishing to fish an easy-to-reach destination with very good fishing and reasonable prices. There are lots of islands, flats, mangrove channels and creeks that hold the most targeted species of the Caribbean all year round. We are offering different fishing programs. We can arrange a day trip beginning early in the morning (at dawn). Our head fishing guide will pick you up at the hotel where you are staying in Cancun to drive you to the marina and keep you fishing for 8 hours. Another program includes accommodation in the "Intercontinental Presidente Cancun" located 30-minute drive from the marina in front of the sea, with a/c and swimming pool and breakfast included, or in the exclusive 5 (*) Hotel "La Amada" in Playa Mujeres located 10-minute drive from the marina, with 3 swiming pools, golf court, 2 restaurants, and in front of the sea. We can also offer a more economic alternative with accommodation in "El Rey del Caribe" Hotel and Spa in Cancun, including breakfast. Located at 20-minute drive from the marina, this hotel offers comfortable air-conditioned rooms with ceiling fans, well-equipped kitchen, swimming-pool, Jacuzzi and a lovely tropical garden. All fishing programs include transfer hotel/marina/hotel and lunch box (sandwiches, fruits and refreshments). Bonefish fly selection should include Crazy Charlie, Gotcha or any shrimp-like pattern on hooks 8 or 6 in tan, pink and white with flashabou. For permit: Brown Special, Fuzzy Crab, Rag Head Crab, Mc Crab on hooks sizes 6 or 4, in tan with white legs, brown and sand. Both for bones and permit the flies shouldn´t be too weighted. For baby tarpon and snook we recommend 16 pound test bimini twist leaders and 60 pound hard shock tippet. Flies should be tied on hooks sizes 1/0 and 3/0, streamers, gummy minnows, deceivers or seaducers in brown and orange, brown and yellow, orange and yellow, black with red, black with purple. 2019 U$S 475.- per one day fishing only for more days pls. ask. Rates do not include: Personal insurance, fishing licensefishing equipment and flies and gratuities. 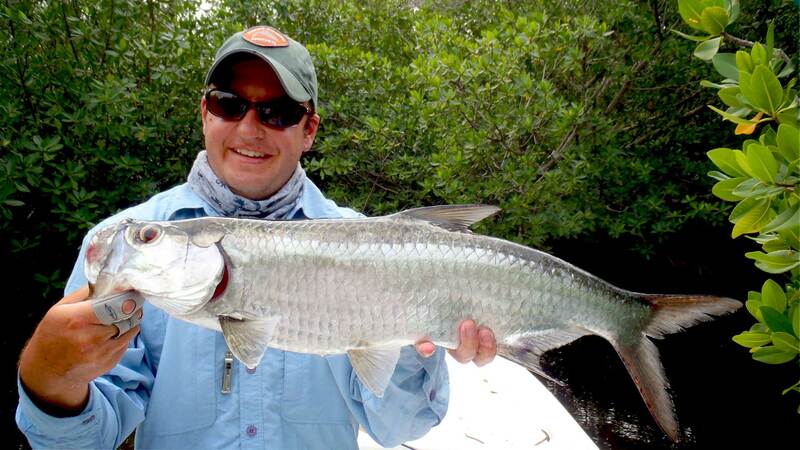 Notes: From April to September it is possible to fish "giant tarpon" with an extra cost of U$S 50.- per day. Good weather and stable, which made the fishing quite profitable. We had a great time in Mexico, the fishing was challenging at times particularly as we had largely overcast weather which made spotting fish much more difficult. That said, with tarpon as an option we had a great time learning more about tarpon fishing and I am firmly hooked on it. Those first few moments are truly explosive! They were all caught in the Mangroves and I don't know what a good day is in terms of numbers but on one day we caught 5 between us. 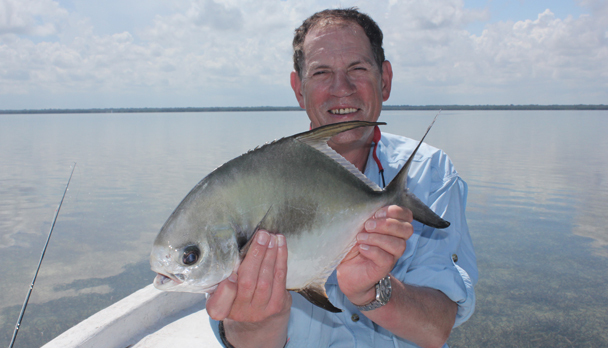 I am mystified by permit as getting the fly in the right place in a school of 50 fish didn't lead to a take on a few occasions - even the guide expressed true shock, so something to learn there. The overcast weather meant we only went for permit on 2 afternoons. The hotel was great and evening restaurants were great too. All in all a fantastic visit, thank you! The guide showed me a reasonable amount of fish on the first day with the opportunity of a grand slam, unfortunately I had not picked up a fly rod for about two years so needless to say I made a mess of more than one cast...but still ended the day by losing a tarpon and losing a permit. Day 1: practice day. Day 2: produced a permit, I was really pleased with myself, my first permit on the fly! Day 3: produced a Grand Slam, if I thought I was pleased the day before now I was over the moon! Day 4: produced another Grand Slam... outstanding!! Day 5: I came back down to Earth with a thump, I only managed a single bonefish, sadly I had a change of guide but still he did show me and present to me the opportunity of catching a grand slam. I did not really bother with the big Tarpon at Cabo Catoche, after catching the permit on the second day I really wanted to concentrate on the Grand Slams instead, I found that I really liked the challenge especially ending them with the Permit. All in all I had a great trip, two grand slams on consecutive days, it may take me some time to repeat or better that! Thank you for organising a fantastic trip! The hotel was fantastic... and we had an enjoyable time with the guide Humberto, although he can be a little impatient at times, he is an excellent guide and really knows his waters... We packed up at 12.30 on the first day - the area we fished had really dirty water and whilst I hooked and lost 2 tarpon we both agreed it was pretty much a waste of time. The next three days we fished an alternative flat which was very enjoyable, but today had to divert to another because of the strong wind. Overall, I had 2 Tarpon, 1 Permit (lost 2 others), 4 Bonefish (didn't see any schools) and 3 Snook. So a good trip as I've never caught Snook on a fly before. Isla Blanca. First of all, I would like to thank you for your services ! First of all, I would like to thank you for your services. Everything turned out as we had agreed, so thank you very much. With regard to the fishing, I highly recommend this experience to those staying in Cancun or Playa del Carmen. In my case, I took a taxi from Playacar to Rey del Caribe Hotel, where Humberto was waiting at 6 am, as we had arranged. We headed to the marina to take the boat, and after a 30-minute boat ride, we reached Isla Blanca. To be able to spot the tarpons, it is essential to get there on a sunny day and with low tide, as they usually get into the mangrove swamps when there is much water and they are impossible to find or catch, unless Humberto calls them!! Hahaha! He has a clever way to make them go out of the inner lagoons that are formed in the mangrove swamps. We had to fish with plenty of water and northern wind, which did not affect the casting. However, it didn?t allow the tide to go out. The casts shouldn?t be done from a long distance, but they should be very precise. If the fly lands too far or too close, the schools of tarpons will be spooked away or they won?t even realize that our fly is in the water. It is more probable to catch one if it is alone, as long as we do things the right way. We saw many schools. At first, we found it hard to pick the right fly, as they chased it, but they wouldn?t take it. We started having good results when we used a black and purple toad and a red and black black death, tied on tiemco 600 sp #2/0 and #1/0. The Owner AKI in similar size proved to be a good option too. With the red and black, we caught the first baby tarpon and I had the challenge of hooking my first baby without lifting the rod. This behaviour was repeated in all the strikes, hooking firmly. I chose to hook and keep steady pressure on the line, then I let it run and held the rod tip down whenever it delighted us with its acrobatic leaps. I took a Cps #8 with floating line and a sage reel with a good brake. This proved to be a good rod in December, as we were only after tarpon and some snook. The second strike was the most violent of our fishing day. When the tarpon took the fly, I hooked it up and when it jumped out, the splice of the line exploded, taking the fly, tippet and leader away. I succeeded in landing two more tarpons. The last one was the best of the day. It had been attacked by a shark; it still had marks of the attack, so that must have been its second verifiable fright. The following are tips for those who are going on this kind of fishing for the first time. Take sun block and insect repellent. Use the flies with the best hooks to be able to hookup firmly. The tippet should be 40 or 50 pound test. Humberto is a good guide and he is very nice to talk to. He receives tips without even asking for them. I went on holiday with my girlfriend, but I negotiated the excursion, so I went fishing alone. It is not recommended to take women who are not used to sailing or fishing, as you never get off the boat and fishing with the radio on is not good. It is amazing to be able to sight fish all the time. Don?t hesitate to do it, if you can! Isla Blanca. Honestly, the trip was perfect. Honestly, the trip was perfect. We were really amazed at the RIU hotel, its beaches, the service, the cleanliness, among others. The company in charge of the transfers and the great excursions was very good too. La Amada Hotel was truly deluxe. The only inconvenience here was the weather. We were told that La Amada would offer all inclusive service in January. I think it is a good decision, because moving from an all-inclusive hotel to other that doesnt offer that service can sometimes be complicated. They told us they´d do that to attract more people, as tourists usually prefer all-inclusive hotels (at least that is what we were told at the hotel). Summing up, the trip was amazing, we had a great time and we are very grateful. With regard to the fishing, the day I set off for Isla Blanca with Humberto was the worst day of all the days I spent in Mexico. When we got to the pier, Humberto offered to cancel the outing and putting it off for the following day, but I had already planned to go to Isla Mujeres with my wife, so we had to stick our chests out and face our day. The wind blew strongly all day long. Even though we didn´t feel is so hard in the mangroves, it was quite annoying. Humberto told me we wouldn´t be able to get to the spot he wanted to take me because it was far away, so we headed to a lagoon that was closer. When we were about to enter the lagoon, it started to rain heavily, so we stayed on board for about 45 minutes waiting for the rain to stop. As soon as it stopped, the sun came out shyly and we got to the lagoon, what changed the outlook for the day. Despite the weather, we spotted many baby tarpon that came out in schools. I think that my lack of experience and anxiety played a dirty trick on me; I was not very accurate when casting and the first three baby tarpon that took the fly unhooked in their first leap (that was when I remembered and understood why there are so many articles on how to hook these fish). Then I was able to send my bad mood away and succeeded in landing one, which weighed about 12 pounds according to Humberto. We were extremely happy. It was about 11.45, so we sailed around for a while and half an hour later, we were forced to return because the rain was coming again. Something similar happened in Cozumel, where my lack of experience and anxiety played a dirty trick on me again. I made many mistakes, but I managed to land several Bonefish. Although the fishing wasn't great, I reached my aim and I came back very satisfied, specially considering it was my first time fishing in salt waters. As I told you before, my fishing expectations in this trip were low because fishing was not the main objective. It will be added to my list of things-to- do in a near future: going on a fishing trip exclusively in a good season. I told Humberto I was coming to visit him again some time. A hug for you, and send our regards to your wife. I hope I bother you again soon! I want to tell you that we appreciate a lot our fishing trip in Cancun. I want to tell you that we (me and my two sons) appreciate a lot our fishing trip in Cancun. Humberto was a very very good guide. Tell him thank you again and thank you Daniel for everything. I hope it was not too difficult to Humberto to guide my kids. I'll call you again next year if I have the money to come back. Daniel, the fishing in Isla Blanca was really very, very good. Daniel, the fishing in Isla Blanca was really very good. 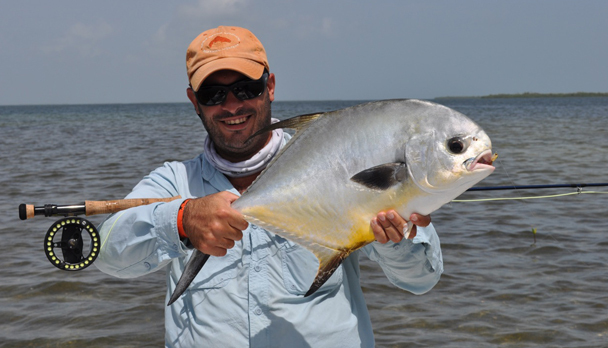 Humberto and I were looking for permit all day long and, without any doubt, we would surely find them in Isla Blanca. There is plenty of permit there, and they are big. Humberto is an excellent guide and a great guy; he knows the area perfectly well, so he knows exactly when and how to find fish. Needless to say, the service was outstanding, both Humberto's and yours. You helped me organize this last-minute trip, everything was well coordinated and you were always attentive and concerned about all the details. As usual, it's been a real pleasure to travel with Fly Fishing Caribe. Isla Blanca. We enjoyed a wonderful week of fishing. Thanks for setting us up on such short notice. We enjoyed a wonderful week of fishing in Isla Blanca. 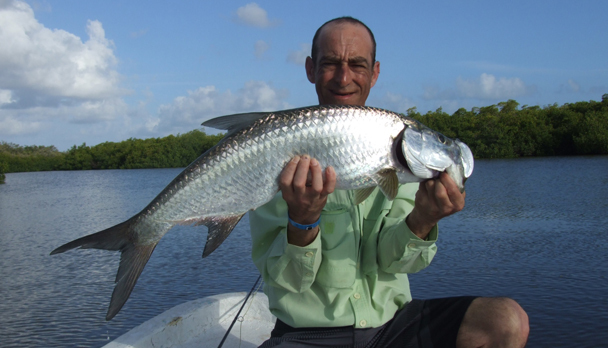 The tarpon fishing was excellent; sixteen fish, weighing from 10-20 pounds. My wife caught one on her first cast of the trip. Tough bonefishing; two fish, not a lot of chances. Permit: lots of chances, without success. (Though I had two fish flatten the hook.) We also caught several barracuda and snapper. One morning we devoted to snook. 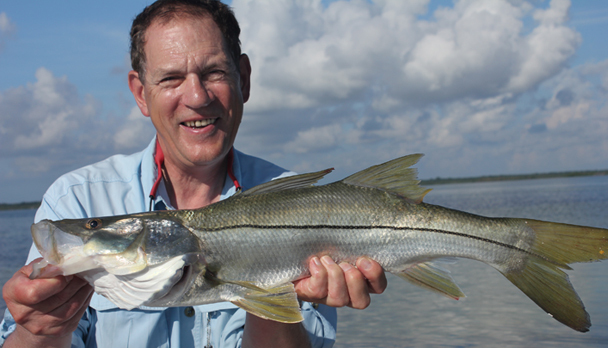 We caught nine snook between 25-29 inches in the first two hours of fishing. Thirteen snook total for the week. Had I known the snook fishing was that good, we might have spent more time on it earlier in the week. All the fish caught for the week except for four snook were caught on flies. The El Rey del Caribe hotel was very nice, as were all the staff. Lots of good restaurants, and everything we needed close at hand. About Humberto. He could not have been more accommodating, nor worked harder to put us on fish. Despite temperatures in the 90's, he poled us 4-5 miles a day. One day, he got out and pushed the boat more than 100 meters in thigh-deep mud to get us to good fishing. Humberto gave us long hours on the water each day. He was very good at spotting fish and putting us in position to cast. It was windy all week and some of the runs were quite long, but his boating skills kept us comfortable and dry. We highly recommend him. Thanks again, Daniel. Isla Blanca. We had a really good day today ! We had a really good day today. Everything seemed fine with payment and tip. The other guide was not Eve. His name is Dino. Thank you for all the help. You have been one of the most thorough people I have ever used to book my fishing trips. I will report that in Angling Report a very well read newsletter about fishing trips and reviews. The truth is that sea fishing has surpassed everyone's expectations. We did very well with the Barracuda and Snook. We couldn't find tarpon, but it doesn't matter. It is the best excuse to come back. Humberto is an exceptional person and an excellent guide. I haven't got any other words to thank him for his guidance and company. Daniel, thanks for everything. I'm sending some photos. Isla Blanca: Our trip to Mexico went really well !!!!!!!! 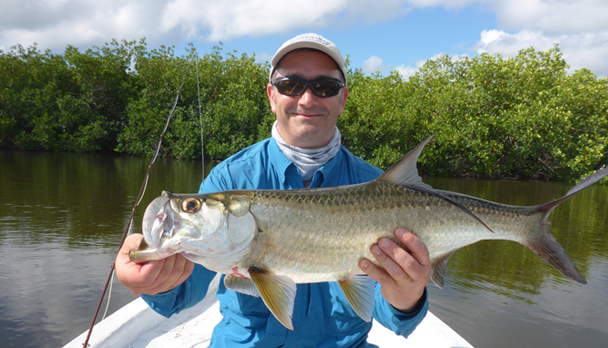 Our trip to Mexico went really well, although the weather made the fishing a bit demanding most days due to strong winds, cloud cover and some big tropical storms which we had to sit out tucked under mangrove trees for an hour or so most days, but it all added to the adventure. Their first tropical storm of the season, 'Arthur' was the culprit. 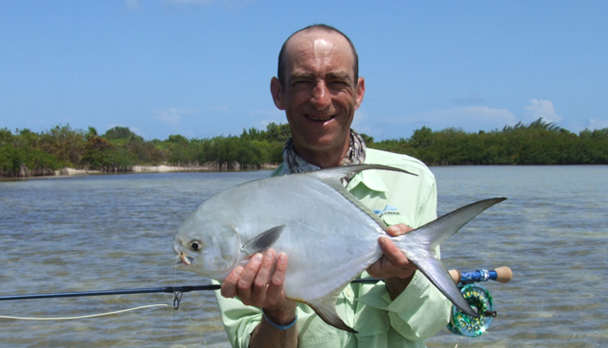 The main reason for us choosing that destination was for me to have the chance of catching my first permit on the fly, which I'm pleased to say I succeeded in doing on our last two days fishing. I managed to achieve it on our penultimate fishing trip just after a big storm - a beautiful fish around 9 or 10lbs. On the last day everything seemed to come together and I managed to catch 4 permit on the fly. Sam (13 years old) had 2 permit on jigs tipped with half a crab on the same day - catching 2 on the 1 crab! Not only that, as he was playing his 2nd permit I spotted another cruising by and we had a double hook up which we have pictures of. When I've sorted them I'll send you a few. Fishing in the mangroves we also jumped 15 tarpon and got 6 into the boat. Only small ones but great fun on a mixture of fly fishing and jig fishing. We also had a few nice snook, especially Sam, which he caught on jigs and plugs. It was a little windy for him most days to fish on the fly. Sam caught lots of small barracuda and we had a few other small species such as catfish and snapper - oh, and I forgot to mention, I had a nice bonefish. Over our few days fishing I had a super slam on the fly and Sam had a grand slam. It worked out that catching that permit on the fly it was my 100th species of fish I've caught on the fly - so it's a fish I shalll never forget. Humberto is a great guide and his knowledge of the area was outstanding although at times we both found it hard to understand each other, but a very nice person and very helpful. We were all very pleased with the hotel you chose for us too, thank you. By the way, if you ever go there again yourself, don't get too close to the lion enclosure at the launch site of the boat. I was chatting to Humberto after the days fishing about 1.5 yards away from the enclosure, the lion was at the other end of the cage when it seemed to come from nowhere, reached out through the bars and took a swipe at me. It was so close that it tore the arm of my Columbia shirt! but luckily enough didn't scratch me - it had been watching me for a few days and I had commented on it - it definitely had eyes for me! That's a story to tell !! 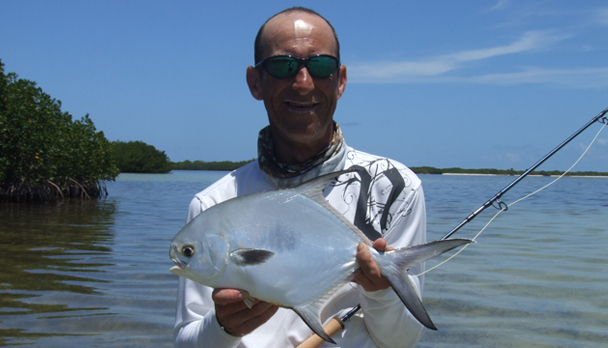 Daniel, the fishing was incredible, I saw more Permit in one day with Humberto than in all my previous trips combined. Due to a defective leader (mine, not his) I broke off 3 fish and landed only one. I also had 4 fish eat the fly and I couldn't set the hook, which I guess counts for something. Isla Blanca. I had a couple of excellent but different days. I was just about to send you a message! I had a couple of excellent but different days. First day was bright and windy and we had 6 permit hooked and 4 landed best about 6lb and 3 snook best about 5lb and a Jack all on crab flies. Second day quite cloudy and heavy rain in pm so we went out ambushing snook had 5 best about 8lb on cockroaches and seducers, 1 permit although covering many others could not get them to take in deeper water! We also had some nice snapper and missed a few tarpon! So excellent sport and learned a lot from Humberto - a great guide! Not sure when I will get out to Mexico again but cannot wait! So Daniel thanks again for organising. The trip to Cancun-Isla Blanca turned out perfect !!!!!!!! The trip to Cancun-Isla Blanca turned out perfect. It has proved to be an ideal destination for a trip with the family. The 3 fishing days were very good. I landed several permits and some tarpons, even though I could have got more if I had more experience in hooking them. The guide Humberto was very kind and attentive, always ready to satisfy his client´s needs. He tried very hard to help me achieve my first Grand Slam. Unfortunately, I couldn´t get it but it was strictly my fault. I hope I can repeat this trip in the near future. Thank you very much for your participation in the arrangements of this trip. Isla Blanca. The fishing was GREAT! The fishing was GREAT! I just put together an album to mail to 'Beto. We ended up fishing the father/son team the whole time. First day, the bossman got a double slam fishing with Humberto. He says "I like Mexico"...we'll be back for certain. I got a big slob Permit myself (my FIRST)...I got three that day, the boat got seven, with shots at five more. I got kicked off the next day (Girls Rule). Beto can pole faster than a speeding permit. He is fun- has a good sense of humor and really cares. He's a good coach. Isla Blanca. He put me on tons of permit and tarpon !!!!!!!! Just finished the day trip with Humberto in Cancun/Isla Blanca. He put me on tons of permit and tarpon and a few skittish bonefish! I caught 3 permit and landed one, caught two tarpon and landed one. Humberto was great and I will definitely request him as my guide next time I am in Cancun. Isla Blanca. Thank you for arranging a wonderful outing !!! Thank you for arranging a wonderful outing with Humberto in Isla Blanca - Cancun, Ed and I both had a great time! We had a wonderful time and Humberto was fantastic! Very knowledgable and funny. We got great pictures and we will definitely be back.